Structural foam molding is known as the low-pressure technique for processing thermoplastics. The molding cavity is filled by the foam from bubbles which is created by the inert gas such as nitrogen which is inserted to the resin. Another process of creating foam is through the gases which are created by the chemical blowing agent. This process is able to create the rigid parts with solid surface. The common understanding of the foam molding process uses high density polyethylene (HDPE). In fact, instead of using HDPE, this process also uses plastics including polyethylene (PE), polypropylene (PP), and also acrylonitrile butadiene styrene (ABDE). The main issue is that this process needs low pressure. When the resin flows in the mold, the surface cells will burst to create skins for thicker and more durable walls of the final products. Before the resin come into the mold, the foaming agent is held by an injection screw. Then, the foam which is produced by the inert gases will be inserted to the molten resin so that it will flow further. 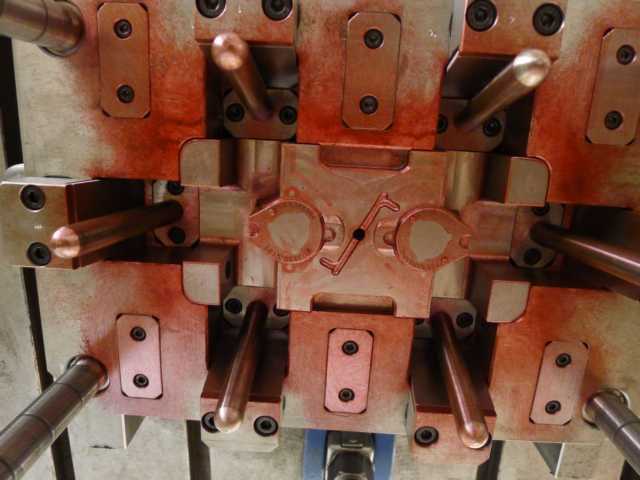 By using structural foam molding, there are some advantages which the manufacturer can take including lower setup cost. Since this process needs lower pressure, the equipment which is needed is economically produced which can result larger parts. In addition, lower internal pressure will also contribute to heavier cellular structure so that the final product will be sturdier. Commonly, resins are inserted into the mold at 500 degree F and cooled at 100 or 140 degrees F. It can cause the piece to set. In-mold shrinkage can possibly happen. However, it depends on some factors such as type and size of the machine and the thickness of the mold. The structural foam is able to shrink immediately after it is released from the mold. It is commonly able to shrink from 1.5 up to 4 percent of the original size. Commonly, structural foam part can be used in the place of concrete, wood, metal, and also fiberglass.